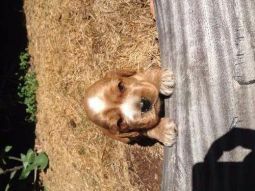 Cocker Spaniel (English) breeders links and breed information on pups4sale.com.au. Who doesn’t smile at the bounding energy of an Cocker Spaniel? Not many other dogs can manage to simultaneously epitomize both the perfect sporting dog and a habitual lap dog, all at the same time! This remarkable multi-dimensional breed has earned the title of “Best in Show” at Crufts a record-breaking seven times between 1928 and 2009, and for good reason. 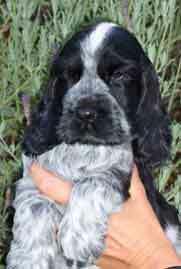 On this page we will detail much more about the Cocker Spaniel; its interesting past beautiful nature, and lots more! 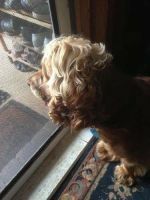 Thanks to Tarrendayle Kennels for the pictures of Cocker Spaniel (English) puppies & adults used on this page, and the additional information provided. 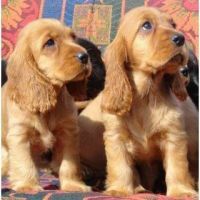 History – Proud little packages of strength and energy, the breed is a descendant of the original Spaniels from Spain, stemming back roughly 700 years. The first recorded mention of a "Spanyell" was found in literature from the 1400s! At first, all Spaniels were categorized as one breed, but in the late 1800s, two distinct types came to the forefront: land Spaniels and water Spaniels. 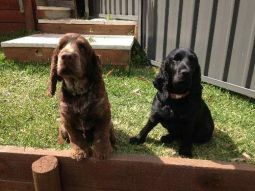 English Cocker Spaniels, which generally comprise the smaller land variety, derived their name from their use in hunting woodcocks. In the field, these dogs are used for flushing and retrieving small game and foul from brush. 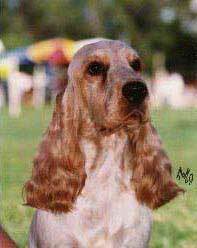 The first real recognition of the breed came in 1936, with the formation of the English Cocker Spaniel Club of America, and in 1946, the American Kennel Club officially recognized the separation between the American and English Cocker Spaniels. 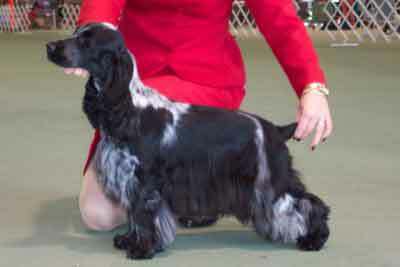 Crossbreeding of the American and English varieties is not encouraged, and as a result, the English Cocker has retained much of its historic characteristics, hereditary, and temperament. 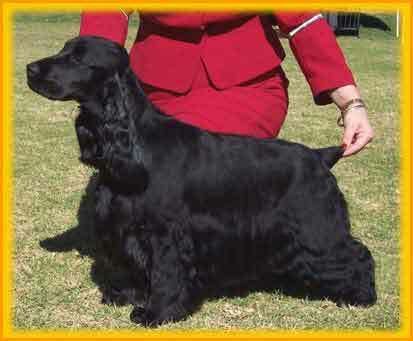 Today, by comparison, the English Cocker is slightly larger, with a longer muzzle, and differently shaped head and differently set eyes than its American counterpart. Breed Standards – Here you can readily see some of the reason for this breed’s popularity. Even at a full grown adult size, the breed rarely grows beyond 40cm/15.5" (for males), and 33cm/13" (for females), and 26-34 lbs., so they are compact enough to be able to fit in comfortably both to house and apartment living. Colours and markings for the breed vary greatly, though the most common colors include gold, black, blue roan (which makes up 60% of the population), red roan, liver roan, orange roan, chocolate roan, and lemon roan (“roan” is another term for having areas of mixed colors on the coat. Other similar terms include ticked, mottled, merle, and belton). 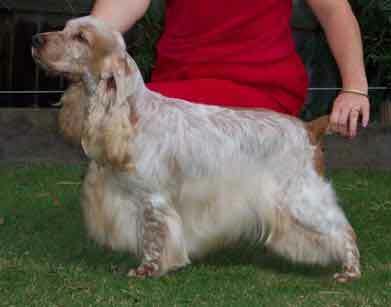 English Cockers can also be separated into three main categories…Field, Working, and Show… but that largely comes from breeding, practicality, and training. Be sure to do your research and contact a breed association for more information and specifics. Energy – Despite its penchant for lovingly warming the feet or lap of its owner, the English Cocker Spaniel does need a healthy dose of daily exercise. A nice long walk, a game of fetch, or a run in the yard should suffice. At its core, though, the English Cocker has retained its instincts as a superb hunting and very “outdoorsy” dog. When you combine that with the fact that the Cocker is a very sociable animal, the activity may need to be moderated in warmer climates. Luckily, the English Cocker, as with most Spaniels, loves water, so a dip into the lake, river, or pool can go a long way to provide both the necessary exercise while keeping your faithful pal cool. Temperament – Of course, temperament of any dog breed can vary, but for the most part, you couldn’t ask for a happier, more affectionate, more intelligent, or more loyal furry friend than an English Cocker Spaniel. It usually shows its joy in doing just about anything by the furiously wagging tail and Cocker “smile” when panting. The Cocker’s loyalty to its family and “home turf” also helps to make it a fairly protective dog, though not outwardly very aggressive. A good watchdog, perhaps they might be initially a bit cautious with strangers. Qualities such as barking, digging, and housetraining might pose some challenges, but as the breed is so eager to please (and smart to boot!) training can be successful fairly quickly. Overall, the English Cocker Spaniel is a wonderful and even-tempered companion. Health – Individual animals live, on average, 12-14 years. For the most part, the breed is fairly healthy, but can experience some issues with ear and eye conditions. Common eye issues may include cataracts, progressive retinal atrophy (PRA), and glaucoma. Particolors are more prone to develop deafness or ear infections (their long ears need constant watchfulness, especially if they are frequently in the outdoors or the water). Other illnesses can include canine hip dysplasia (also known as CHD, more common in solid color English Spaniels), familial nephropathy, and cardiomyopathy. A good diet, regular check-ups, moderate exercise, and a careful owner’s eye will go a long way in helping your companion live the longest and healthiest life possible. Grooming – That sweet, expressive face and the flat, silky coat are two earmarks of the breed. If groomed to standard, the coat is kept fairly long, and slightly wavy (also known as “feathers”), especially on the chest, belly, sides, on the backs of the front and rear legs, and the ends of the ears. Groomers won’t groan when they see the English Cocker coming, because only the hair around the head and ears needs clipping, as well as some occasional tidying up around the tail and feet (every two months or so). A good summer cut could entail a full-body shave, leaving the “feathers” mentioned above. Of course, as a responsible pet owner, you will need to shampoo (once every week or two), and brush the coat regularly (two to three times per week, especially if active outdoors). If you are not already familiar with brushing the English Cocker’s undercoat and top coat you can get some general tips or guidance from a vet’s office, groomer, breeder, or pet supply store. Consistent brushing and care will help ensure that the coat will not become matted, and will also help curb shedding. While brushing, be sure to examine the skin for any abrasions or other problems…and it would also be a good time to also check and clean the ears. Try to clip nails weekly. Negatives – There might be a slight price to pay for having such a lovely, silky coat. Some grooming is required (though if yours is not a show English Cocker, you could probably handle the grooming needs yourself). Brushing the top and undercoat two or three times a week also needs to be factored into your care schedule. The breed is prone to eye conditions, and deafness (more commonly found in the particolors). Some training may be required, and a gentle hand is suggested, since the breed has a sensitive, intuitive nature. Positives – The positives far outweigh the negatives with this jovial, convivial breed! Size-wise, the breed is well suited to both apartment and home living. While requiring some exercise, it’s no more than most other breeds. But, if you want a hearty working dog, this one will keep up with you, no doubt. Intrinsic to the breed is also a keen nose and hunting instinct, so if a sporting dog is on your list, this one fits that bill too. Best of all, if your plans entail nothing more than lounging on the couch or reading by the fire, your faithful Cocker Spaniel will happily never leave your side. While the American Cocker Spaniel may have eclipsed the popularity of the English variety in the United States, the original English Cocker Spaniel is still beloved and renowned throughout Europe. Inquisitive, loyal, biddable, and equally happy being lazy or bounding in the park, it would be hard to find fault with the English Cocker. Indeed, this marvelous breed has earned the nickname “the merry cocker” for good reason!